You know, the time during that temple, it's not -- people like to think it's liberated, the camp or Cambodia. But really, it's politics, and I didn't know then. The Vietnamese had invaded Cambodia, the Vietnamese soldiers. In a way, many people think -- Cambodian people think they liberate us. Many, you know, think they invaded, the Vietnamese invaded Cambodia. Then I was -- right away by the Khmer Rouge, like thousands of other kids that survived, were also forced to carry guns. They took the flute away. I play the flute; I played an instrument while they were, you know, all this killing going on with the Khmer Rouge in the camp right before the Vietnamese invaded. I was asked to play music for the Khmer Rouge. 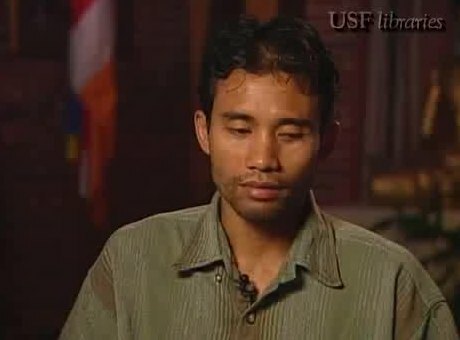 I had a teacher who came and taught us five days, and then the Khmer Rouge killed him. We young people were forced to do a lot, and I was many times forced to take off clothing and stuff like that, off the victims, and went to the orange field to help out, you know, holding people's hands while they stuck the bayonet in them, and seeing all that. I was playing music, and then they took the flute away. Then thousands of kids were forced into the front line. I was carrying the -- they called it carbine. Carbine is a smaller gun, American guns, and it's a bird shooting gun. I was scared. I never had a gun before, and the Khmer Rouge had no time to train us. And I know if some kid, a kid just asked them, "I can't, I don't want to go, I'm scared," they shoot them. So, I knew. I just took the gun and go, and they trucked us to go with thousands of other kids to go in the front line and to draw the fire first and get killed first, like a shield. This was hard, because I'd never been in the war before, and I remember my mom told me during the peacetime about war and stuff like that, and said, you know, "You put the -- if you want to be safe, you put the earth into your head," and stuff like that. I tried that. I put the dirt in my head and prayed I can meet my mom again.